We want you to feel good, and having the smile you have dreamed of contributes to how you feel about yourself. We offer the best in preventive and restorative care to give you a healthy, beautiful smile. With today’s advancements in dentistry, a smile makeover takes less time and is affordable for every budget. Come in and let us explain what whitening, bonding, crowns, and veneers will do to make your smile beautiful! Perhaps you think the only way to have a straight, even smile is with years of wearing orthodontics. But with porcelain veneers or crowns, you can have a new smile with uniform teeth in as few as two visits! Veneers and crowns will correct misshapen, gapped, or discolored teeth to give you a healthy, dazzling smile! Veneers are durable, hard sheets of dental ceramic that are bonded to your own teeth. They can be applied to all your anterior teeth or just one that might be chipped or cracked. When used to correct only a certain tooth or teeth, the veneer is made to match the shade of the other teeth so they blend in and look very natural. When teeth have cavities, large cracks/wear, or inadequate tooth structure then porcelain veneers may be inadequate. In these cases your teeth need full coverage crowns, which are cemented over the entire tooth to restore your beautiful smile! Perhaps you have seen ultra whitening techniques advertised in magazines or on television. Returning your teeth to a brilliant white is best obtained through professional-strength whitening. 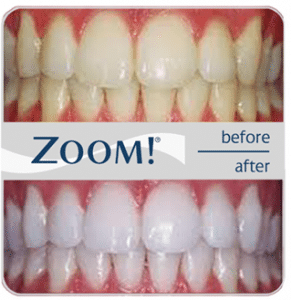 You can once again have your teeth dazzling with our in-house method using Zoom!™ Whitening. In just one visit, you can remove stains and discoloration – and these whitening changes can last for years! We also offer whitening trays that we custom fit and make in our lab. We provide the necessary supplies, and when you follow the instructions you will have great results in 1–14 days. Schedule a complimentary consultation by calling (614) 771-6060, and discover how cosmetic solutions and teeth whitening can give you a brilliant new smile!